Ryan Park’s senior year looked to be promising, along with returning seniors Allen Kim and John Kim. The team got off to a solid start, with Ryan contributing in every category and Allen in the zone from the outside. Overall, the team had a hard year full of close losses. They lost two heartbreakers to rival Daegu on buzzer-beaters. When they played at DAHS, a last second three sent the game into overtime, and another last second three completed the boys’ defeat at the end of extra time. The highlight of the season was definitely the 20 point comeback against TCIS. The boys fell behind early. A change of strategy at half time, along with renewed energy from Allen and Ryan, surged the Guardians past the Dragons. 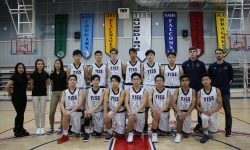 At the end of the season, both tournaments were disappointing, although Ryan Park ended the season on a high note, leading the team in points, steals and assists. He also received KAIAC all-conference and all-tournament honors, along with Far East all-star honors.